This interview was originally published in 2010. Today’s entrepreneur success story features Ben Coleman. Ben created a business around his love of origami, the art of folding paper into objects. What type of career did you have before you launched your business? In my previous job, I worked for a manufacturer of propane trucks. I managed the production schedule, handled inventory, and also wrote the manuals for our trucks as well as about a thousand other duties. It wasn’t an easy job but I liked it. Then I was laid off. Prior to that job, I taught high school math, and before that I ran a computer retail sales business. How long did you look for a job and how did your job search go? I looked for a job for about a year. I sent out between 325 and 400 resumes. It was really depressing because not only was the labor market dead, but lots of new unemployed were entering it. I fell through the cracks in terms of COBRA, and all the unemployment extensions because I had been laid off a few months prior to the “official” recession. It was clear to me that if I continued to seek employment as part of the conventional work force that I would become homeless in a matter of months. What type of business did you start? I released my second book “Advanced Origami Bonsai” electronically after the publisher rejected it as “too specialized” in June of 2009. And I released my third book “Origami Bonsai Accessories” electronically in March of 2010. I sell all three books on my website and I also sell the first mass-produced, pre-folded origami flower in the world (my patented invention) there as well. When my own money ran out, I had help from my parents. I expect to have repaid them (with interest) in full in about two months. Companies are now coming to me to write books for them! In the past eight weeks I made more than I made in a year working for the propane truck company. My second and third books are selling well all over the world, and because they were too “specialized” for the publisher, all the profit from their sales is mine. My business is customer-driven. I learned that from working at the propane truck company. I think it’s really important to answer customer questions quickly, and in a coherent and respectful manner, and then to confirm with the customer that you answered their question satisfactorily. The same customer that gets their questions answered goes out and tells three friends what a great book they bought. If I ensure that my customers are successful, then I’ll be successful automatically! I also think that having taught math brings a unique skill set and perspective to the table when it comes to explaining things that seem, at first, to be complex. After having learned how to explain concepts to teenagers, I’ve learned to innovate, and bring some fun into the learning experience. And I’m sure that my experience as a small businessman in the early days of personal computing helps a lot with day to day operations. I recognize that taking chances, carefully, is part of the entrepreneurial process. Figuring out what needs to be done next. It’s important to remember that there is always something that needs to be done, it’s just a matter of finding it. I don’t like doing things like paying sales tax, but I love making sculptures. The sales tax isn’t going to pay itself, and if I don’t pay it I won’t be in business for long. So the chores come first so I can free my mind to work on the creative stuff. Believe it or not, I’m not sure I like writing the books. I’m really hard on myself, constantly asking questions, “Will they understand it?” “Does it make sense?” “Can’t I find an easier way to represent that?” When I’m working on a book or magazine project I work about 14 hours a day, with real high intensity, until the project is done. Once it’s done I can make some art! Success hangovers. I’ll sell a record number of books, or I’ll be in a newspaper, or something else important to the growth of my business will happen, and then it will be weeks or months before something better happens. I start to think I’m depressed, but in fact I am frustrated. I have to constantly remind myself that the most important thing is slow, continuous growth, not instant fame. Instant fame comes and goes, and that’s not what I’m in business for. People. I don’t know how to say this, but I had to learn how to deal with people in a more coherent manner. I used to always say things like, “Your business is appreciated.” Now I say, “I appreciate your business.” If you can’t see the difference, then you’ve got the same problem I used to have. I have learned to make a person to person connection, almost emotional, but professional, with customers. I make it clear that I care. It’s not just about making customers the number one priority, it’s about connecting with them on a whole new level. Just because you’re starting a business doesn’t mean you have to give up your job search. In fact, I’d argue that you should continue your job search until your entrepreneurial venture starts paying the bills. My parents insisted that I continue looking for a job even though it was clear that my business was supporting me. It’s not called the conventional job market for nothing. Wives, parents, children, friends, are all a lot more comfortable if you’re looking for a job, so avoid the controversy and continue. But start your business venture. Start it right now. The world market is huge, and I believe there’s room for everyone in it. This is the first time in human history that a specialty business in Akron, Ohio, USA can be found easily by a customer in Sao Paulo, Brazil. And it costs nothing to make your presence known. Get your product or service on the web. Start manipulating search engines. Put a brochure on Scribd.com. Give people a way to find you and they will find you. I don’t think there has ever been a better time to start a business. The web changes everything. Individuals have never had access to markets like they do today. Thank you, Ben! Your story is amazing. I’m sure most people would not have guessed you can make a living from origami! 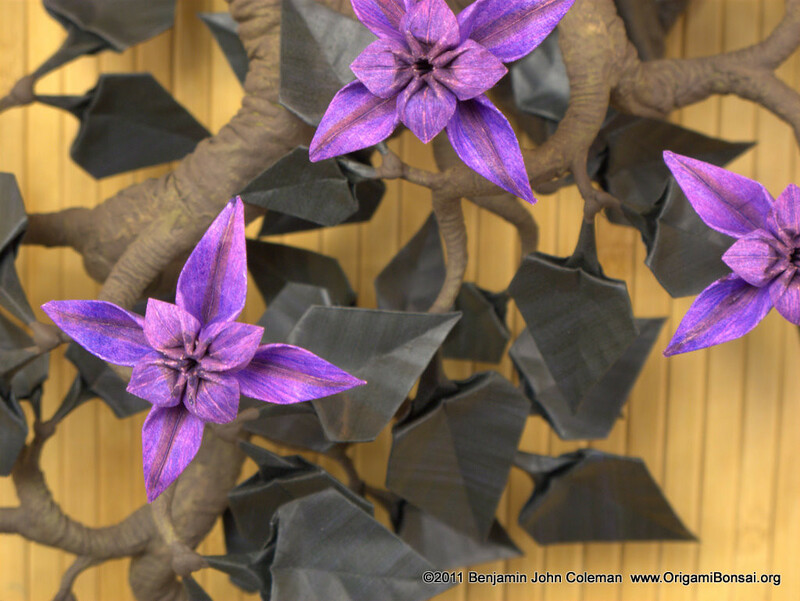 Please visit Ben Coleman’s website at OrigamiBonsai.org.